Houston is a huge, diverse city that can be a little intimidating to navigate if you’re new in town. There are so many options when it comes to neighborhoods to live in, or just different parts of town to hang out in. 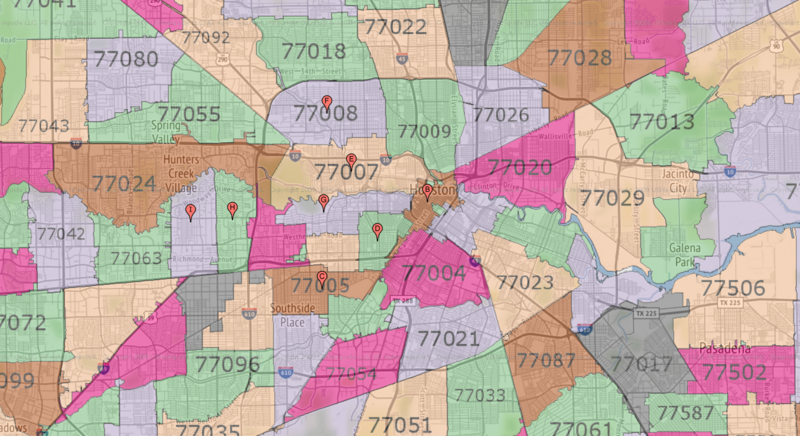 But no matter if you’re in the 77002 or 77019, there’s something special about all of the Houston zip codes. Check out a few highlights of what you can find in each zip. With nearly 200 zip codes to choose from, here are some of the most popular areas in Houston. While most Houstonians think of downtown as a fun place to visit, it’s actually a great place to live, too. It’s an especially convenient choice for those who work nearby. It’s also great if you just want to be close to the many attractions Downtown has to offer, such as the Buffalo Bayou Walking Trail or Discovery Green. West U’s name comes from its proximity to the University of Houston and Rice University. Trust us, the night life here does not disappoint. Local dive bar Under the Volcano is a favorite. Breathtakingly beautiful Montrose is an amazing place to live or spend an afternoon. You can see renovated mansions, charming cottages, and bungalows with screened porches nestled together. Check out the Montrose Shop for unique finds and Instagram photo ops. Tons of young urban professionals live in the Rice Military neighborhood. This ultra-cool area is named for nearby Camp Logan, which is now Memorial Park. The Heights is one of the most desirable neighborhoods in Houston. Cute bungalows, trendy new buildings, and fancy apartments abound here. Plus, there’s great food, too. In the mood for Tex-Mex? Try Teotihuacan. If you’re looking for amazing real estate and upscale dining and shopping, River Oaks is the perfect place. Want to catch a movie? River Oaks Theatre is an art deco throwback that shows the latest indie and foreign films. Shop to your heart’s content in the Houston Galleria, the largest mall in Texas. You’ll also find dozens of tasty dining options. Houston can be a difficult city to learn. A zip code map may come in handy, especially if you’re looking at real estate. Try this one. Now that you’re familiar with the major Houston zip codes, it’s time to pick the right one for you! Think about which features are most important and attractive to you and your family. Do you prefer quiet suburbs or trendy nightlife? Either way, Houston can accommodate all tastes and interests. Whether you’re in the mood to watch a movie or hit up a dive bar, there’s something here for you. If you’re interested in moving to the Greater Houston area, we are happy to help. Ameritex Movers know the ins and outs of all the areas, and we’d love to set you up in your new home. Read about our services and get a free quote today!